The full color cover photo and the inside black and white photography are by social activist, photographer, and rock legend Patti Smith. This is one of Waldman’s most important poems; a feverish inspection of the damage still being wrought by the Vietnam War on a society struggling to preserve its unique culture and natural beauty. Patti Smith’s photographs which accompany the text, fit so well, and accentuate the passionate ironies of the poem. 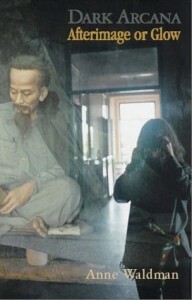 Patti and husband Oliver Ray had traveled through Vietnam and captured some extraordinary images. Waldman even dedicates the poem to them. The entirety of this book length poem reappears in Waldman’s Iovis III: The Eternal War.